Wave devices have been slow to emerge as grid-connected energy sources, but there might be a future for the gizmos in the spy business. Or, at least, offshore patrol. Ocean Power Technologies, the New Jersey company that has been delayed and delayed and delayed again in moving forward with a much-ballyhooed energy-producing project in Oregon waters, said it has deployed its Autonomous PowerBuoy 35 miles off the Jersey coast in waters around 150 feet deep. This is a collaboration with the Department of Homeland Security Science & Technology Directorate Borders and Security Division, with a grant from the Maryland Technology Development Corporation also pitching in, and it follows the demonstration two years ago of the same buoy in a Navy program called Littoral Expeditionary Autonomous PowerBuoy (“LEAP”). 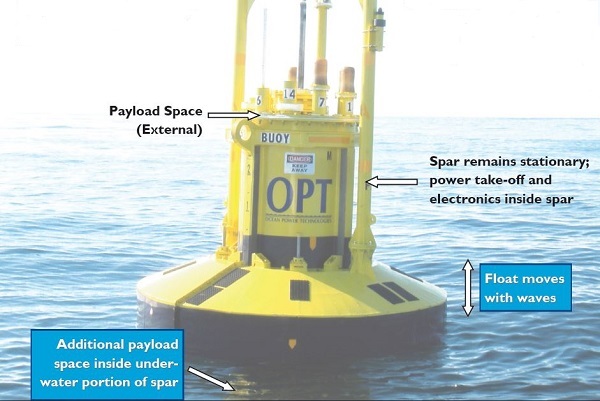 That deployment got a little interesting when Hurricane Irene roared through, but the OPT buoy withstood wave heights of up to 15 meters (nearly 50 feet), while keeping nearly constant communication with onshore monitors who observed the device’s status and performance, the company said. But the real big deal with the APB-350 PowerBuoy is its ability to produce the power needed to run sensors that detect and track vessels around the clock, all without anyone having to tend to the buoy for years (theoretically, at least). The alternative to using the power of waves is often diesel, OPT said, and diesel generators don’t refuel themselves. Plus, they’re dirty. OPT is leveraging its experience from the LEAP program, which featured HF radar capability for surface vessel detection, to demonstrate an enhanced tracking technology covering a wider variety of vessels. The application includes an acoustic sensor system in addition to the existing HF Radar. This will allow the PowerBuoy to collect data for surface and sub-surface ocean observing and surveillance duties, demonstrating the use of the PowerBuoy technology for dual detection capabilities. Moored to the ocean floor and floating on the water’s surface, the PowerBuoy rises and falls with the waves. A power take-off system converts the mechanical stroking that results from this motion to drive a generator.